when there’s safety in good night. Last night I walked a sobbing, overly tired little kid to bed. We were supposed to play a game together as a family but exhaustion proved to us that the only proper place for her to be was in bed. I helped her brush her teeth through hiccupy sobs and put pajamas on her sleepy crumpled body. She put up a good fight. I read her two stories. Sang her the two songs I’ve sang to her every night since she’s been mine, curled up behind her and tickled her back until the gasps stopped and her breathing slowed. I kissed her little forehead, covered her with her pink Cinderella blanket, said the five words I say every night “sleep well my little princess” and closed the door. Aside from the sobbing part, this happens almost every night in our house. No big deal, it’s our routine. I ended up back downstairs and somehow clicked on a link to a video from Egypt. A dark video full of violence and the sounds of death and terror. I may be doing exponentially better than I was four weeks ago, but violence still tears through my brain with shocking efficiency. This one hurt my heart too, because unlike those prime time crime shows, this is real. I sat there wishing I could bring Egypt to my house, read it a story and tuck it safely into bed. I got ready for bed and went back in to see Addie, her tiny little body curled up, her face surrounded by mopsy curls…fast asleep. I had fixed her night. She fell asleep knowing she is loved and safe. And while I can’t do this for an entire country, I can do it for one little girl. And that’s pretty powerful, and for now it’s going to have to be enough. sometimes making those we love feel safe is the best thing that we can do & when they feel loved I have to think that eventually the world will be a better place. Beautiful post. And that photo is divine! Thank you for putting my feelings into words. Exactly what I wanted to say about the events in Egypt, but couldn’t find the words. 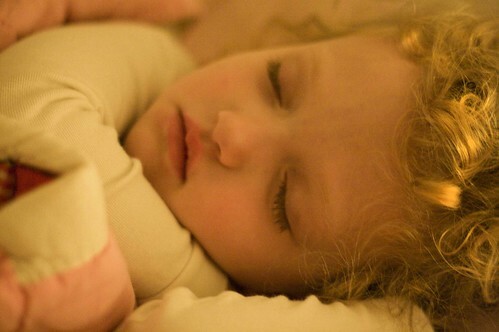 Sleeping children are one of the sweetest joys in life. Oh you are just beloved by me. And that mop of curls, too. By extension/empathy. She’s an angel. Sounds a lot like the bedtime routine at my house too. Beautiful and thought provoking. I only hope that someday I will be able to tuck in my own little princess and make her know that she is loved. Your baby is beautiful. I sing my girls the same song every night too. We have a pretty solid routine. I think it helps them settle down for the night. Potty, brush teeth, prayers, story & song. It takes time, but one day it will be gone and I will want it back. Those shows make me super sad. The world can be such a bad place. At least for now I can keep my girls safe from the world. The heart of a mother- I wish I could gather all the hurt or sad children into my house. But you’re right, loving and caring for one’s own children does a lot because every day, Addie will remember that love and do incredible things because of it. oh my, she is so cute. And also? If I watch the news, I don’t sleep. TLC FTW! I can’t watch news – it’s too hard. My brain brings everything home and then suddenly everything is happening in my living room – or I start fearing it will. I’m a worrier. Your Addie is so precious. My husband is like you, it’s bad for him to watch the news. Stories of horrible things happening, lost children…it all rips right through his soul. There is no compartmentalizing. It’s just raw pain. *hugs* You are a beautiful soul. And being able to tuck in that one person and make her safe…that is the most important thing in the world. You are stressing about EGYPT? Oh girl, talk about internalizing the whole world’s pain why don’t cha?! And now I’m dying to know those two songs… hmmm what are they? Can I guess? Give said the little stream?? I’m right aren’t I?? Egypt will live on. As it hurried down the hill. My sappy for the night. I want to do that for Egypt, too. Every molecule in me is rooting for the people. I can’t watch things I used to watch…like the news. It hurts my heart way too much. and yes, bedtime is such a safe time here too. and sometimes we take it for granted that not everyone has a mommy singing sweet songs at night to “fix” things. Your posts always make me take deep breaths…in a really good, I-needed-that kind of way. Good GRIEF! That picture is full of gorgeous.